Istanbul is among the applicants to be 2017 Green Capital of Europe! Considering the loss of green open spaces in the city, loss hectares of northern forests for the roads and the third bridge, and Gezi Resistance sparked on the demolishment of Gezi Park last year, it truely sounds like a joke for people who are familiar with the context. 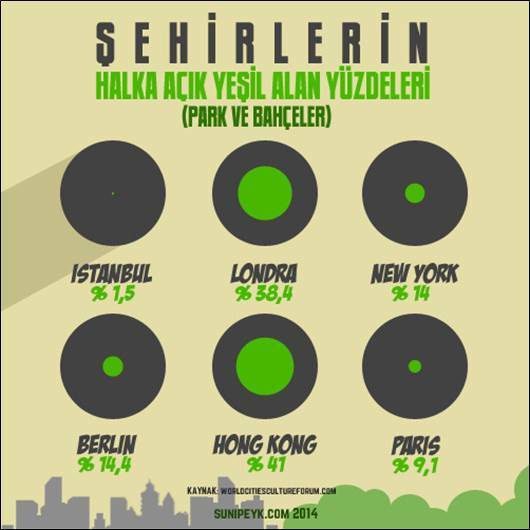 Here is the condition of public open spaces in Istanbul together with a comparison with other global cities according to World Cities Culture Report 2013. The application comes at a time when the city’s authorities are clamping down on environmental protests while forging ahead with projects that threaten Istanbul’s few green spaces. Read the full story here with reactions from activists here in Guardian article.